Dotting the scenic Arizonan landscape are its beautiful native plants and trees. 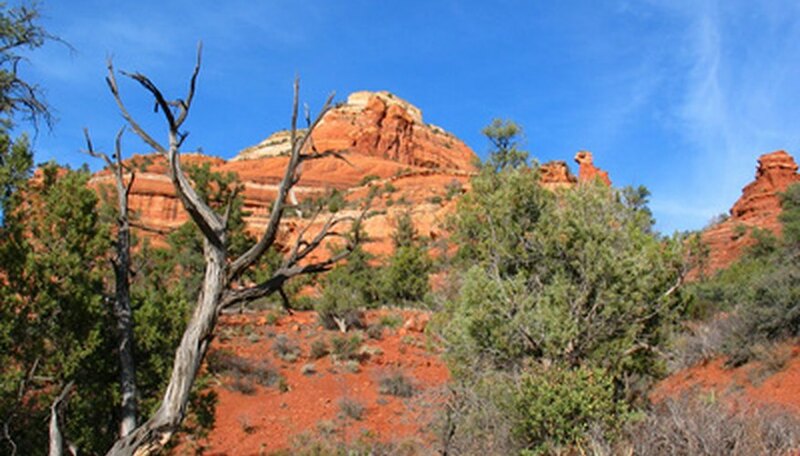 After centuries of adaptation to the land, these native plants and trees survive and grow naturally in Arizona’s varying soils and sun exposure. As awareness heightens and efforts increase to preserve Arizona’s irreplaceable flora, these and other plant and tree species have a good chance of being around and benefiting the environment for future generations. As Arizona’s state flower, the saguaro cactus (Carnegiea gigantea) is a flowering plant that thrives in the dry soils and full sun of the Sonoran desert. The saguaro cactus is listed on the Arizona Department of Agriculture’s Highly Safeguarded Protected Native Plants list. It reaches 50 feet in height and produces white and yellow flowers and edible green fruit in the fall. A member of the Pinaceae family, the bristlecone pine is native and endemic to Arizona, New Mexico and Colorado. The bristlecone pine (Pinus aristata Engelm.) is a perennial evergreen tree that grows up to 40 feet tall. It grows in full sun and is drought-tolerant, and its purple flowers bloom in midsummer. The bristlecone pine is listed on the Salvage Restricted Protected Native Plants list of the Arizona Department of Agriculture. This list names the plants that are protected by law against physical damage and theft. Velvet mesquite or mesquite (Prosopis velutina Woot.) is a perennial deciduous tree of the Fabaceae family, native to Yavapai County in Arizona, San Joaquin Valley and the central and south coasts of California and New Mexico. It grows as a shrub or a tree that reaches less than 50 feet high. The tree does well in full sun and moderately moist soil. Velvet mesquite is listed on the Arizona Department of Agriculture’s Salvage Assessed Protected Native Plants list, which means that salvaging the velvet mesquite and replanting them in other areas supports the plant’s existence and has a positive effect on the environment. An evergreen perennial shrub of the Agavaceae or agave family, banana yucca (Yucca baccata Torr.) is native to the southwest region of the United States—Arizona, Texas, New Mexico, Colorado, Utah, Nevada and California. From the banana yucca’s short stems grows its firm leaves up to 40 inches long. The plant itself reaches 4 to 6 feet in height and tolerates dry soil and full sun to moderate shade. The white, bell-shaped flowers of the banana yucca bloom in a cluster in the middle of the plants in late spring every year. Thereafter the plant’s edible, banana-shaped fruit grow in the summer. Other common names of banana yucca include Spanish dagger and Spanish bayonet. Banana yucca is included on the Arizona Department of Agriculture’s Harvest Restricted Protected Native Plants list, with limitations on how much and how often the plant is harvested or cut.